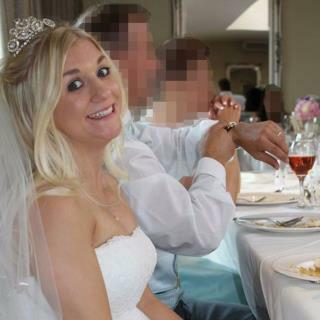 (Newser) – Samantha Wragg hadn't had time to dust off her wedding dress and take it to the cleaners before she found out her new husband was cheating on her. So what did the British woman who works in social media do? List her dress on eBay to help foot the bill she says her husband has left her with for the divorce. Heeding the advice of her brother, she spiced up the listing by revealing some of the dirty details, she reports on her blog. In the days since, bidding has climbed from the initial $2,600 asking price to cover what her parents paid for it new in 2014 to roughly $85,000 with less than two days to go. Wrapp apologizes for only including two pictures with the listing, but when the cheating came to light, "I pretty much burned/permanently deleted everything with his disgusting face on it!" Typical of a WOMAN(Wife) SCORNED! Idioms. hell hath no fury (like a woman scorned) used to refer to someone, usually a woman, who has reacted very angrily to something, especially the fact that her husband or lover has been unfaithful. There ya go ALL! !